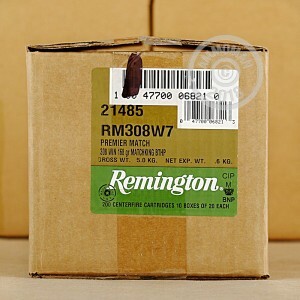 All Remington ammunition is made to high standards. 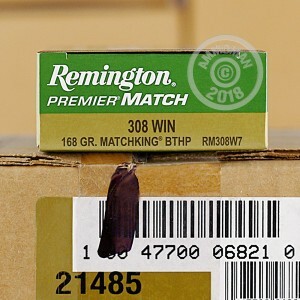 However, to obtain maximum performance, Remington manufactures its Premier Match ammo with even greater care than its other loads, using only the most uniform brass cases and precision-made match-grade bullets. 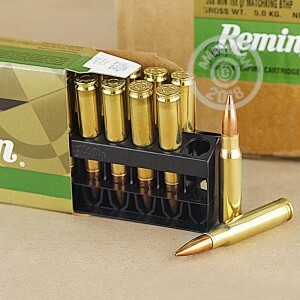 These .308 Winchester cartridges are ideal for precision shooting or competition in a battle or long-range rifle and use a 168 grain hollow point projectile. The bullet's boat tail helps it shrug off wind and other forces as it makes its way to the target. This case of 200 rounds comes in 10 boxes of 20 rounds each and uses non-corrosive Boxer primers and reloadable brass cases. Buy this case or any other items totaling $99 or more to get free shipping from AmmoMan.com's warehouse to your doorstep!